The military Internet will make it possible for commanders and bosses at different points to keep in contact. Source: ITAR-TASS. The armed conflicts of today demand a completely new approach to military control. The Russian army’s response has been to create its own Internet system. At the beginning of September, the Army Signal Corps of the Western Military District (ZVO) put its “military Web” to the test as part of their training exercises, announced head of the ZVO press service, Col. Andrei Borbun. This new network unites military compounds and bases across Russia’s territory, from Kaliningrad and Nizhny Novgorod, to Severomorsk and Voronezh. 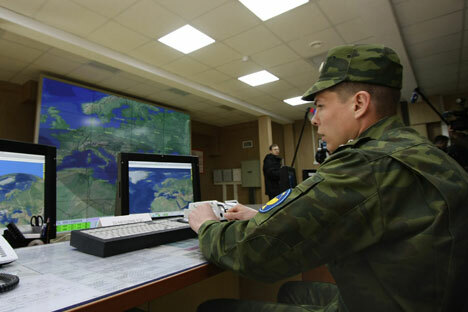 “During the exercises, the ZVO’s military signalers created an independent, multilayered network of nodes and communications posts, connecting military formations and units across the territory of the ZVO, the Baltic and Northern fleets, and air bases,” Borbun said. According to Borbun, video conferences were held as part of the exercises, during which authorized persons could listen to one another, manage and oversee electronic document circulation, and exchange large volumes of graphic and video materials. In addition, the military Internet will make it possible for commanders and bosses at different points in the ZVO to keep in contact; for example, video calls can be held with teams serving on ships across the world’s oceans, explained Borbun. The military network is very well-protected from external threats, and this means information can be exchanged with the highest degree of security. So far, there have been two army training sessions where closed-field control networks have passed the tests; the Iskander tactical ballistic missile system was also approved. To compare, the volume of information that needs to be transferred in order to control the Iskander is the same as the information held on the network of an average-sized Russian city – approximately 150 megabytes (MB). Other steps are being made toward improving army communications systems, as well. The Ministry of Defense is gradually weaning itself away from having to rent communication lines from the civilian telecommunications provider Rostelekom. The ministry is now creating its own special communications connections, which will be protected from hackers to a greater degree. The fact of the matter is that Russian communications operators have strong links with foreign operators, which makes it more likely that the policy of secrecy and confidentiality will be breached and information leaked. The military activities of the United States in Yugoslavia and in the Middle East have shown how the Internet can simply be switched off at the request of security agencies within these countries. Therefore, in spring 2012, Russian security forces set up an experiment simulating an Internet shutdown, wherein they covered an area equal to 57 countries the size of Estonia with their own tropospheric scatter communications network. According to Deputy Prime Minister Dmitry Rogozin, Russian military research can see ahead, at the furthest, five to seven years. This means that Russia has little chance of overtaking other countries in terms of military developments. On the other hand, the widespread application of high-tech mediums in the Armed Forces spurs on their development for civilian use. On the whole, “the only way [Russia] can get ahead is to understand the evolution of thoughts, the evolution of technologies, and go by the quickest route toward the goal we have before us,” Rogozin said. “Our most important task is to kick-start a new wave of industrialization in the country and use technologies that can be used in two or three different ways; and, in doing this, we will finally be able to drop our doomed dependency on oil and gas,” the deputy prime minister said.